During wound repair, fibroblasts orchestrate replacement of the provisional matrix formed during clotting with tenascin, cellular fibronectin and collagen III. These, in turn, are critical for migration of endothelial cells, keratinocytes and additional fibroblasts into the wound site. Fibroblasts are also important in the deposition of collagen I during scar formation. The CXC chemokine chicken Chemotactic and Angiogenic Factor (cCAF), is highly expressed by fibroblasts after wounding and during development of the granulation tissue, especially in areas where extracellular matrix (ECM) is abundant. We hypothesized that cCAF stimulates fibroblasts to produce these matrix molecules. Here we show that this chemokine can stimulate precocious deposition of tenascin, fibronectin and collagen I, but not collagen III. Studies in culture and in vivo show that tenascin stimulation can also be achieved by the N-terminal 15 aas of the protein and occurs at the level of gene expression. In contrast, stimulation of fibronectin and collagen I both require the entire molecule and do not involve changes in gene expression. Fibronectin accumulation appears to be linked to tenascin production, and collagen I to decreased MMP-1 levels. In addition, cCAF is chemotactic for fibroblasts and accelerates their migration. These previously unknown functions for chemokines suggest that cCAF, the chicken orthologue of human IL-8, enhances healing by rapidly chemoattracting fibroblasts into the wound site and stimulating them to produce ECM molecules, leading to precocious development of granulation tissue. This acceleration of the repair process may have important application to healing of impaired wounds. Chemokines are small, positively charged, secreted proteins that consist of an N-terminal region of variable conformation, three antiparallel beta-pleated sheets connected by loops, and a C-terminal alpha helix . These proteins are multifunctional, with different regions of the molecules, in particular the N- and C-termini, performing specific functions [e.g. [1–4]]. Chemokines are best known for their functions in attracting and activating leukocytes. Shortly after injury, these small cytokines are primarily produced by fibroblasts, chemoattract leukocytes and activate their integrins causing them to adhere strongly to the endothelial cells as a prelude to their migration through the blood vessel wall to the underlying tissue and towards the source of the chemokine . In addition to these functions during the early stages of wound healing, these small cytokines are also known to be involved in re-epithelialization, angiogenesis and granulation tissue development [3, 6–8], processes that are critical for proper healing. The first evidence that chemokines are associated with wound healing in vivo was reported in 1990 using the chemokine cCAF (chicken Chemotactic and Angiogenic Factor; the product of the 9E3 gene), a CXC chemokine that is now known to be the ortologue for human IL-8 . cCAF is expressed to high levels very shortly after wounding and during the first 24–48 hours after injury, and remains elevated for at least 16 days after wounding [6, 10]. It is primarily expressed by the fibroblasts of the granulation tissue, especially where interstitial collagen (Coll) is abundant, but the levels are also high in the endothelial cells of the microvessels, in the healing epidermis and in the connective tissue beneath the skin [6, 11]. In the chicken chorioallantoic membrane (CAM) assay, low concentration of cCAF results in chemotaxis of monocyte/macrophages and lymphocytes and the formation of a granulation-like tissue beneath the chemokine-containing pellet . After four days of exposure to this chemokine, the ectoderm of the CAMs becomes thickened and the amount of fibrillar collagen in the tissue is markedly increased, strongly suggesting that cCAF is able to initiate some of the primary events that lead to granulation tissue formation . Fibroblasts are important cells in the healing process. Upon injury, they are activated by the cytokines and growth factors released during the coagulation process to produce chemokines and additional cytokines and growth factors that are important in setting up the cascade of events that lead to granulation tissue formation. Activated fibroblasts proliferate and migrate across the provisional matrix formed by the fibrin-plasma fibronectin (FN) clot. As the clot is digested by plasmin, fibroblasts replace it with cellular FN, tenascin (TN) and Coll III [12, 13]. These extracellular matrix proteins are critical for migration of endothelial cells, keratinocytes and additional fibroblasts into the wound and are important for proper generation of healthy healing tissue. Some of the fibroblasts differentiate into myofibroblasts, which contract to close the wound [4, 14, 15]. Myofibroblasts are fibrogenic, showing elevated expression of interstitial collagens, laminin, FN and TN, and inhibitors of matrix metalloproteinases such as TIMP-1 [15–19]. Because cCAF is expressed highly in the granulation tissue of wounds in areas where ECM is abundant [3, 6, 11], and it stimulates fibroblasts to differentiate into myofibroblasts , we investigated whether this chemokine stimulates the production of the four major ECM molecules mentioned above, interstitial Colls I and III, TN and cellular FN. Here we show that cCAF stimulates cultures of fibroblasts to produce TN, FN, and Coll I, albeit with different dynamics and that these ECM molecules are also increased in wounded tissues treated with cCAF. To mimic the wound environment, we used primary embryonic fibroblasts cultured under very low serum conditions. Unlike adult primary fibroblasts, these cells have many of the properties of wound fibroblasts. They are able to proliferate rapidly, to synthesize tenascin and other non-collagen extracellular matrix molecules, and they have the ability to differentiate into myofibroblasts [4, 20] that are characteristically found in the granulation tissue of wounds. The presence of small amounts of serum in the culture medium mimics the conditions of the healing adult wounds, where serum factors are more abundant than in normal tissue. When exposed to these factors, embryonic wounds heal in the same manner, with scarring, as adult wounds do [21, 22]. We used primary cell cultures because cells that are passaged many times can acquire genomic changes, lose their differentiated phenotype and display altered ECM expression . However, because the cells are derived from different embryos, there are variations in the levels of cellular responses reflecting the genetic variation present in vivo. Therefore, we always include internal controls and do not average results from different batches of cells; in each figure, data are from one representative experiment. For the studies in vivo, the results shown are all from the same experiment so that correlations can be made between the immunolabeling and immunoblot analysis for each ECM molecule, and direct comparisons can also be made between the three ECM molecules. In adults, TN, specifically TN C, is present almost exclusively in the granulation tissue of healing wounds [12, 24]. In addition to providing a matrix for rapid migration of cells during wound repair, TN supports differentiation of fibroblasts into myofibroblasts , which then produce more TN than do normal fibroblasts [15, 18]. Because cCAF stimulates fibroblasts to differentiate into myofibroblasts, we tested the possibility that this chemokine also affects TN production. Immunolabeling of cells treated daily for four days with 750 ng/ml of the chemokine showed that cCAF stimulates the cells to produce more TN than the control cells (Fig. 1A &1B). We have previously determined, using dose-dependent studies, that this concentration is optimal for functions of this chemokine on these embryonic fibroblasts and in processes of granulation tissue formation [3, 4]). Although chemokine concentrations of 10-2-10 ng/ml can chemoattract and activate leukocytes, chemokines acting on other cell types such as endothelial cells, smooth muscle cells and fibroblasts require concentrations in the range of 102ng/ml and higher [4, 26–28]. This is within physiological range; for example wound fluid from burn patients contain MGSA (a chemokine that is highly homologous to cCAF) concentrations of 102–103ng/ml . Because both the N-terminal and C-terminal peptides of cCAF have been shown to be functional in culture and in vivo (1–4, 30), we also tested these two peptides (Fig. 1). The N-terminal 15aa peptide produced an effect at least as strong as the whole molecule (Fig. 1C) whereas the effects of the C-terminal peptide (28aa) was closer to those of the control (Fig. 1D). 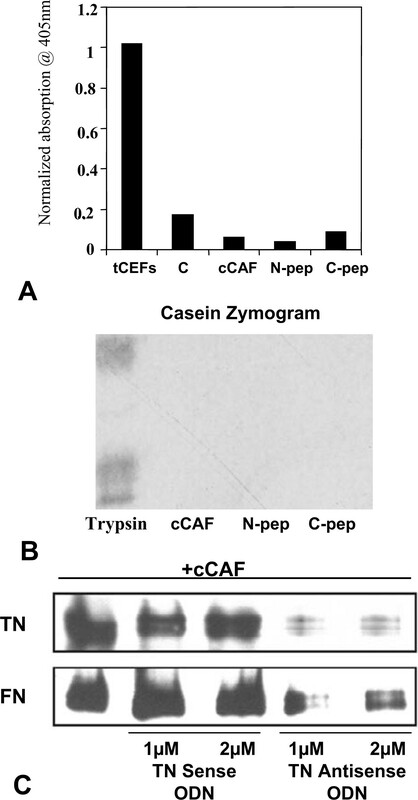 Western blot analysis of extracts from treated fibroblasts confirmed that cCAF increases production of TN in culture, that this effect also can be accomplished effectively by the N-peptide, but that the C-peptide produced an elevated, but substantially smaller, response than either the N-peptide or the whole cCAF molecule (Fig. 1E). To determine whether cCAF stimulates TN expression we examined the levels of mRNA for this ECM molecule. RT-PCR analysis showed significant increased levels of mRNA for TN after treatment with either cCAF or its N-peptide (Fig. 1F) but the increase stimulated by the C-terminus is much smaller correlating with the small increase in protein levels. Effect of cCAF on TN levels in culture. (A-D) Embryonic connective tissue fibroblasts immunolabeled for TN. (A) In untreated cultures, some fibroblasts show a small amount of staining for this protein, which is characteristic of CEFs in culture. (B&C) Cultures treated for 3 days with cCAF (B) or with the N-terminal peptide (C) show that more fibroblasts stain for TN and that the staining is more intense than for untreated cells. (D) Treatment of cells with the C-peptide has a smaller effect on the number of cells staining for TN. (E) Immunoblot analysis for TN to quantify the results observed in (A-D). All lanes contained equal amounts of total protein, as measured by the DC protein assay (BioRad). Cells treated with cCAF or the N-peptide for 3 days show higher levels of TN than untreated or C-peptide treated cells. (F) Northern blot analysis of TN mRNA. Fibroblasts were treated with cCAF or its terminal peptides, total RNA extracted using TRIzol reagent and RT-PCR was performed as described in Materials and Methods. Amplification of TN mRNA reveals a substantial increase inTN mRNA with cCAF and N-peptide treatments whereas the C-peptide stimulated a small increase. To quantify the amount of RNA present, an internal control against 18S rRNA was used. To determine whether this effect is also observed in vivo, excision wounds were made on the underside of wings of 2 week-old chicks. To avoid variations in genetic background, for each bird one wing was treated with vehicle and the other with cCAF, and treatments were applied every other day for 5 days. In normal wound healing, TN appeared at days 2–3 and disappeared during remodeling which begins around day 10 after wounding. Therefore, tissues were collected at days 3 and 7 after wounding and analyzed for TN by immunostaining and western blot analysis (Fig. 2A &2B). Immunoblot analysis of protein extracted from control wounds confirmed that TN deposition begun by 3 days and that it increased dramatically by 7 days (Fig. 2C, Control). In contrast, by 3 days, cCAF-treated wounds already contained as much TN as the control at 7 days and that by 7 days, the TN is dramatically reduced by the ongoing processes of repair (Fig 2C, cCAF). Thus, the addition of the chemokine to wounds shifts the peak of TN in the wound tissues to earlier stages of wound healing than in control wounds. Levels of TN in the granulation tissue of excision wounds. Paraffin-embedded sections of excision wounds treated every other day with vehicle or 1 μg cCAF were immunostained with an antibody against TN. At 3 days after wounding, control wounds (A) show almost no labeling for TN whereas those treated with cCAF already show substantial labeling for TN (B). 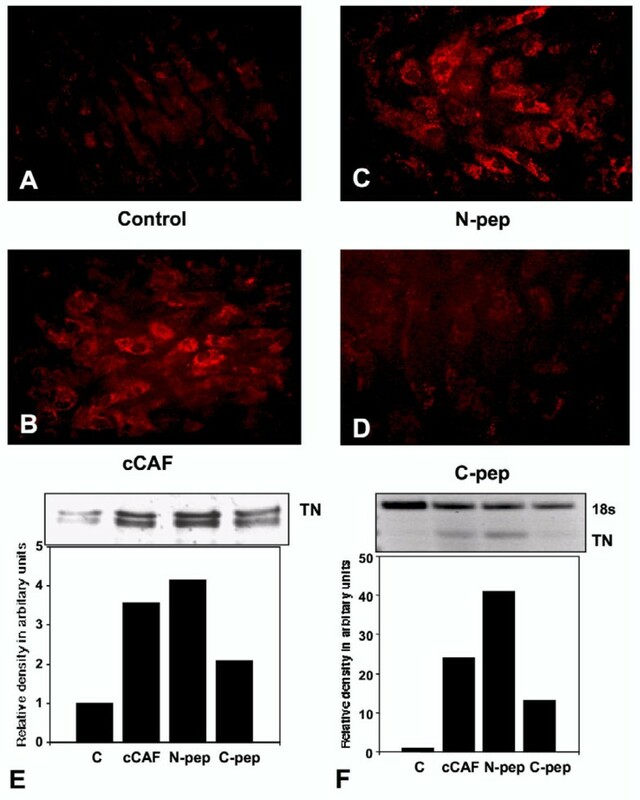 (C) Immunoblot analysis of proteins extracted from treated and control tissues reveals that treatment with cCAF results in greatly increased levels of TN within 3 days after wounding, but that by seven days, the amount of TN in the treated wounds had decreased whereas untreated wounds showed levels similar to those of cCAF treated at 3 days. All lanes contain equal amounts of total protein, as measured by the DC protein assay (BioRad). Cellular FN is abundantly present in granulation tissue, is produced primarily by the wound fibroblasts and myofibroblasts. Fibroblast cultures treated as for TN, produced much more FN, as shown by immunolabeling (Figs. 3A &3B) and immunoblot analysis (Fig. 3E). Unlike TN, this effect can only be accomplished by the whole cCAF molecule; immunolabeling and immunoblot analysis of cells treated with the N-peptide (Fig. 3C &3E) or C-peptide (Fig. 3D &3E) revealed similar FN levels to control. Unlike TN, cCAF did not affect FN mRNA levels (Fig. 3F). In vivo, immunostaining for FN, 3 days after making excision wounds, showed that levels of this protein are high in the healing tissues and that treatment with cCAF increased FN accumulation in the granulation tissue (Fig. 4A &4B). Immunoblot analysis for FN extracted from excision wounds showed that by 3 days after injury the cCAF-treated wounds contained more FN than the control wounds but that the levels by 7 days are similar to those of the control (Fig. 4C). Effect of cCAF on FN levels in culture. Embryonic connective tissue fibroblasts immunolabeled for FN. (A) Untreated 3 day-old cultures show FN fibers over the cells. (B) Cultures treated with cCAF for 3 days show more fibers, and the staining is more intense than those in the controls. (C,D) Cells treated with the same amounts of N-peptide or C-peptide have levels of FN similar to control. (E) Immunoblot analysis of cells treated with cCAF show higher levels of FN than untreated or peptide-treated cells. All lanes contain equal amounts of total protein, as measured by the DC protein assay (BioRad). (F) Northern blot analysis for FN shows no difference in mRNA levels between control and cells treated with cCAF for times up to 48 hours. Levels of FN in the granulation tissue of excision wounds. Paraffin-embedded sections of excision wounds treated every other day with vehicle or 1 μg cCAF were immunostained with an antibody to FN. Three days after wounding, control wounds (A) show less labeling for FN than those treated with cCAF (B). (C) Immunoblot analysis of protein extracted from treated and control wounds reveals that treatment with cCAF causes increased FN levels at 3 days but at 7 days the FN protein levels to approximately the levels of the control. Taken together the results in culture and in vivo suggest that the chemokine does not stimulate FN gene expression but rather may directly or indirectly affect stability of this protein. Therefore, we tested the possibility that cCAF treatment leads to stability of the protein by stimulating decrease in matrix degrading enzymes. In chickens, plasmin generated from plasminogen by plasminogen activator (PA) degrades much of the FN. To investigate whether activity of PA might be decreased with cCAF treatment leading to accumulation of FN, we examined the levels of PA activity. Our results showed that there is no detectable PA activity in untreated or treated fibroblasts whereas the activity is high in RSV-transformed CEFs (tCEFs; Fig. 5A) which are known to produce high levels of PA . Because PA does not appear to be activated by cCAF, we tested the possibility that the stability of FN is due to a decrease in MMP production/activation. In humans, MMP-3, MMP-7 and MMP-10 (stromelysins) are the most active proteases for FN, but these molecules have not been isolated in chickens. However, we can test for general activity of these MMPs in the chicken system by zymography using casein as substrate (Fig. 5B). Whereas the positive control (trypsin) was able to digest the substrate at specific sites in the gel, the supernatants of our treated fibroblasts did not. This suggests that the stromelysins are not active in this system or that our test is not sensitive enough. To further investigate whether MMPs are involved in the cCAF induced high levels of FN will require evaluation of matrix-degrading enzymes specific for chickens and is an ongoing project in our laboratory as we obtain/develop probes for theses MMPs. However, another possible mechanism for the cCAF-induced FN accumulation could be linked to an increase in TN. TN-C knockout mice show decreased accumulation of FN in wounded tissue and this decrease has been hypothesized to be due to disrupted incorporation of FN into the matrix in the absence of TN-C [32, 33]. To determine whether cCAF-induced TN production is involved in the increase in FN observed after cCAF treatment, we used antisense phosphothioated oligonucleotides to inhibit TN production. Sense oligonucleotides did not have an effect on cCAF-induced TN or FN production. However, the antisense oligonucleotides were able to significantly decrease the production of both TN and FN (Fig. 5C). Potential mecahnisms for cCAF-induced FN accumulation. (A) Analysis of plasminogen activator (PA) activity. Using a synthetic chromogenic substrate (Boc-Val-Gly-Arg-β NA.AcOH) there was an increase in fluorescence detected in supernatant from Rous sarcoma virus transformed fibroblasts which secrete large amounts of PA but not with the control or cCAF-treated supernatants. (B) Casein zymography to detect MMP-3, MMP-7, and MMP-10. No detectable caseinolytic activity in the supernatant of control or cCAF-treated fibroblast was found. The general protease trypsin was used as a positive control. Because this enzyme is not pure, multiple sites of protein digestion were seen. (C) Blocking TN expression using antisense oligonucleotides. Immunoblot analysis of TN and of FN; equal amounts of protein, as determined by using the DC protein assay kit (Bio-Rad),were loaded in each lane. Use of antisense TN oligos blocked the cCAF-induced expression of both FN and TN, whereas the use of sense oligos had no effect on TN or FN levels. To determine whether cCAF stimulates fibroblasts to produce increased levels of Colls I and III, we treated cultures as for TN. Immunoblot analysis for Coll I showed that cCAF, but not the N- or C-peptides, caused a small increase in Coll I protein levels (Fig. 6A). Probing the same blots for Coll III revealed no cCAF-induced difference in the level of production of this protein (Fig. 6B). In vivo, Coll I was also slightly increased by treatment with the chemokine at 3 days after wounding but did not increase to higher levels than the control at 7 days, whereas the same blots probed for Coll III showed similar levels in treated and control at both 3 and 7 days (Figure 6C). Effect of cCAF on collagen levels. (A&B) Immunoblot analysis for Colls I and III, respectively. All lanes contain equal amounts of total protein, as measured by the DC protein assay (BioRad). Treatment of fibroblasts with cCAF, but not the C- or N-peptides, stimulates a small but reproducible increase in protein levels of Coll I when compared with untreated cells (A). Neither cCAF nor peptide treatments changed Coll III levels (B). (C) Levels of Colls I and III in wounds treated with cCAF. Immunoblot analysis of protein extracts from wounded wings treated with 1 μg of cCAF were performed as described in Materials and Methods section. Coll I levels are slightly higher than those of the control after 3 days of treatment with cCAF. However, they are similar to those of the control at 7 days. Coll III levels do not differ between control and cCAF-treated wings. The effect on Coll I could be due to remodeling of this protein by proteases induced by the chemokine. Therefore, we tested whether cCAF affects the production or activity of the gelatinases MMP-2 or MMP-9, or the collagenase MMP-1, all of which digest collagens I and III. Using zymography, we found that treatment with cCAF or the peptides does not alter the levels of proMMP-2 and there was no detectable levels of proMMP-9 (Fig. 7A). 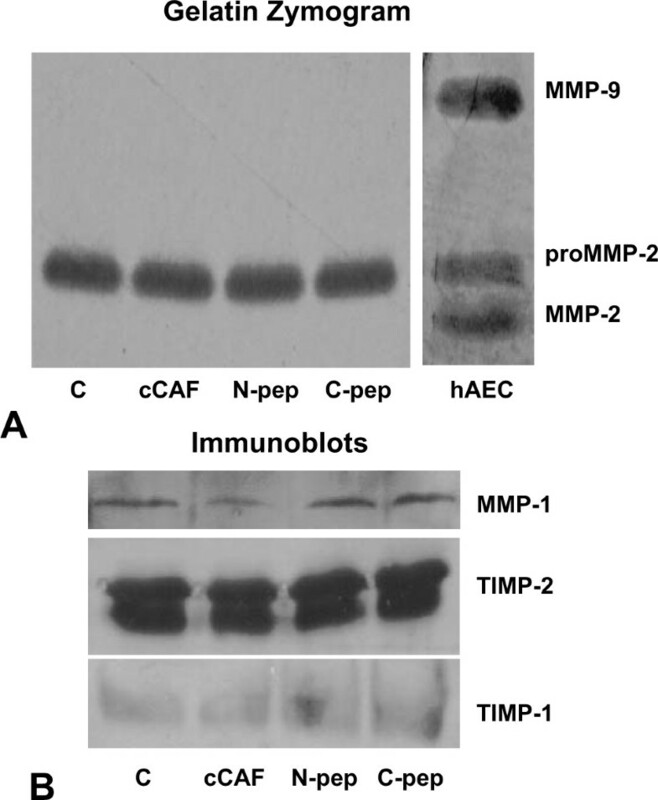 However, immunoblot analysis using a polyclonal antibody to human MMP-1 (this reagent is not available for the chicken homologue of this matrix metalloproteinase) showed that cCAF treatment caused a decrease in the amount of the collagenase MMP-1 detected, but neither TIMP-1 nor TIMP-2 (two natural inhibitors of these MMPs) levels were changed, as evaluated by immunoblot analysis with a monoclonal antibody to the corresponding human proteins (Fig. 7B). Effect of cCAF on the gelatinases, MMP-2 and -9. (A) Gelatin zymography of supernatants from cCAF-treated fibroblasts. The cells produce only detectable levels of pro-MMP-2 and neither cCAF nor its terminal peptides affects MMP activity levels. No proMMP-9 or activated form, were detected. Human aortic endothelial cells (hAEC) which produce and activate MMP-2 and produce pro-MMP-9 were used as positive control. (B) Immunoblots of the fibroblast supernatants. The levels of the MMP-1 protein are slightly but reproducibly decreased by treatment with the whole cCAF molecule but not by either of its terminal peptides. The levels of TIMP-1 and TIMP-2, the natural inhibitors for some MMPs, are not affected by treatment with cCAF or its peptides. During healing, fibroblasts migrate into and within the wounded tissue and lay down the extracellular matrix that forms the granulation tissue. These ECM molecules, especially TN and FN together, stimulate cell migration, thereby facilitating the entrance and movement of additional fibroblasts and of endothelial cells into the wound tissue. Because tissues treated with cCAF have more FN and TN at the time that these cells are entering the wound and chemokines are well known for their chemoattractant properties [34, 35], we tested whether cCAF stimulates chemotaxis of fibroblasts using transwell assays. To avoid effects of gravity on cell migration, the top chamber was inverted, the cells were plated on the underside of the membrane, allowed to adhere to it and then the chamber was turned right side up. The cells were incubated overnight in standard medium to allow expression of the cCAF receptor(s) and the following day cCAF was applied at increasing doses (100–1000 ng/ml) to the top chamber only. The migration assays were carried out for 24 hrs. We found that cCAF stimulated migration of the fibroblasts up the concentration gradient in a dose-dependent manner (Fig. 8A). To test whether the cCAF-induced effect is due to chemotaxis, we repeated the transwell assay and compared cell migration when cCAF is added to both wells. Placing cCAF in both wells abrogated cell migration, strongly suggesting that this protein chemoattracts fibroblasts (Fig 8B). We also tested the effects of the chemokine on migration by using the cloning ring assay. In a specified length of time, cells treated with cCAF moved a longer distance than did control cells, corroborating the previous results that the chemokine stimulates cell motility (Fig. 8C). In situ hybridization for cCAF showed that the migrating fibroblasts also express higher levels of cCAF (Fig. 8D &8E; see also ref. ). Effect of cCAF on fibroblast migration (A) Using Transwell membrane assays we determined that treatment of fibroblasts with cCAF for 24 hours resulted in increased migration toward the chemokine. This effect is dose-dependent with an increase detected at doses of 100 ng/ml and strongest at a dose of 1000 ng/ml. Serum-containing medium was used as positive control. (B) When fibroblasts were treated with 1000 ng/ml cCAF in both wells migration to the upper side of the membrane was abrogated. (C) Fibroblasts plated inside a cloning ring. Cells were allowed to migrate away from the edges of the ring for 2 days while treated with 100–1000 ng/ml cCAF. Treatment with cCAF resulted in a significant increase in the distance migrated by the fibroblasts (* = p < 0.05; n = 4). (D&E) In situ hybridization shows that the fibroblasts migrating away form the edge express cCAF. Dash-dot lines show the edge of the culture after scraping. In (D) arrowheads point to cells labeling with the antisense probe for cCAF whereas in (E) they point to scattered labeling over the cells incubated with the sense probe. The work presented here shows that cCAF, the IL-8 of chickens, stimulates expression of several ECM molecules important in development of the granulation tissue. We show that: (i) cCAF stimulates TN expression and that a 15 aa peptide containing the N-terminal sequence causes the same effects as the whole molecule; (ii) in contrast to its effects on TN production, cCAF-induced increase in FN and Coll I accumulation requires the whole molecule; (iii) the increase in FN protein is not a result of a corresponding increase in mRNA, or increase in MMP production or PA activity but appears to be linked TN production; (iv) increase in Coll I correlates with decreased levels of MMP-1; (v) cCAF chemoattracts fibroblasts and accelerates their migration; (vi) treatment of excision wounds with cCAF increased the levels of all three ECM molecules in the granulation tissue of wounds albeit with different dynamics. This is the first demonstration that treatment of wounds with a pro-inflammatory and angiogenic chemokine accelerates development of the granulation tissue during healing by stimulating the precocious deposition of ECM molecules that are critical for proper healing. We showed previously that cCAF is highly expressed in the granulation tissue of wounds [6, 36], that this chemokine and several of its human homologues stimulate differentiation of fibroblasts into myofibroblasts both in culture and in vivo, and that the latter effect can be achieved very effectively by the N-terminal 15aas of the protein [4, 37]. In addition to cCAF, other CXC chemokines have been associated with wound healing events. In the granulation tissue of burn wounds, expression of groα /MGSA and CXCR2 (the receptor for MGSA) was associated with fibroblasts, smooth muscle cells/myofibroblasts and a subpopulation of macrophages . Groα/MGSA and IL-8 have also been shown to enhance re-epithelialization of human skin grafts in chimeric mice [29, 38]. It has also been found that several CXC chemokines can modulate angiogenesis , a process that is critical for proper healing. Some CXC chemokines, such as IL-8 and cCAF, are angiogenic in vivo[3, 39–41]. Others, such as IP-10 (interferon-γ10) and PF-4 (platelet factor-4), are anti-angiogenic. In the case of IP-10, it has been shown that in transgenic mice treated with this chemokine, wounds heal poorly and exhibit defects in angiogenesis and development of the granulation tissue . Work of others has shown that TN is expressed in association with differentiation of myofibroblasts and is important in cell migration during healing [25, 42–44]. Here we show that cCAF and the N-peptide stimulate fibroblasts in culture to express TN and that this increase in TN is due to an increase in mRNA levels. The increase is lower for C-peptide treated cells; after 3 days in an environment mimicking the wound, these cells had lesser but significant tenascin protein levels, most likely due to the small increase seen in mRNA. In addition, in wounds treated with the chemokine, TN levels are much higher at early times after wounding but drop by 7 days after wounding. At this stage, the wounds are closed and are beginning to remodel in the cCAF-treated wounds while the granulation tissue in the control wings is still maturing. These data taken together strongly suggest that as chemokines induce the differentiation of fibroblasts into myofibroblasts they contribute to the production of TN in the granulation tissue. Our finding that the N-terminal peptide is able to stimulate expression of TN much like the whole protein is potentially important because this small peptide may be useful to develop therapeutic agonists or antagonists for wound healing. The effect of cCAF treatment on Coll I accumulation in culture and in wounded tissues is small but reproducible. Because MMP-1 levels were also decreased by cCAF treatment, it is possible that the small rise in Coll I levels is due to decreased degradation of this ECM molecule by the collagenase. Another chemokine that has been associated with Coll I production is monocyte chemotactic protein 1 (MCP-1). This chemokine belongs to the CC chemokine family and stimulates Coll I production both by lung fibroblasts taken from areas of inflammation  and in kidneys that suffer from crescentic nephritis . The former investigators reported that MCP-1 increases collagen accumulation not by decreasing the levels of the collagenase MMP-1, but by stimulating the production of TGFβ1, a well-known stimulator of collagen expression and expression of TIMPs, the natural inhibitors of MMPs. In addition to MCP-1, IL-8 and MGSA have also been evaluated for production of collagen . These investigators reported that treatment of normal fibroblasts with these chemokines did not affect collagen levels. 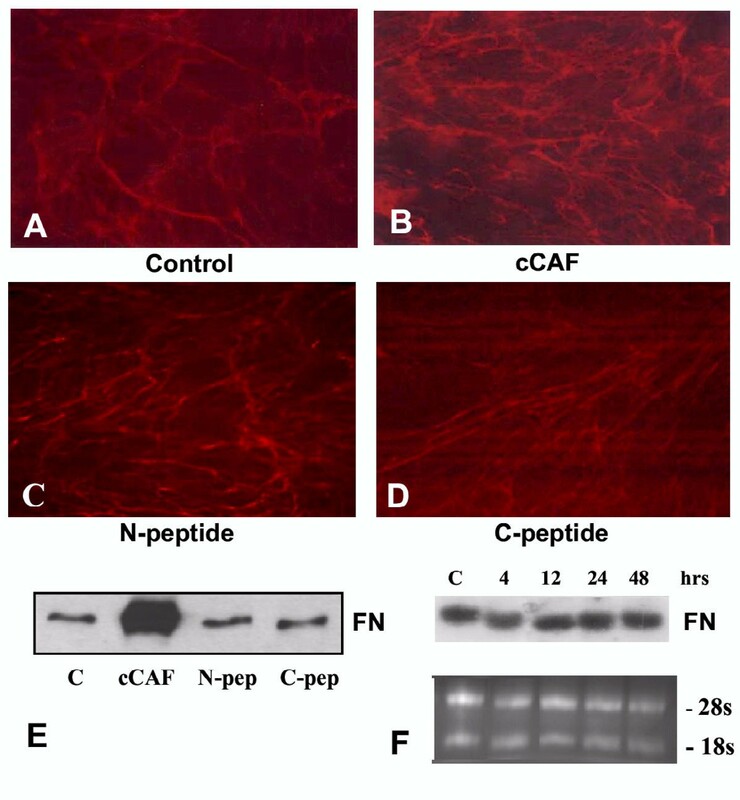 It is not clear from their results whether the elevation in collagen production in normal fibroblasts may have been small, like that observed with cCAF, and therefore gone unnoticed. FN accumulation due to cCAF treatment also differs from that of TN. The FN mRNA levels are not affected by cCAF treatment but the protein accumulates in culture and in the granulation tissue of wounds upon exposure to the chemokine. By analogy with the increase in Coll I, we hypothesized that decrease in protease levels/activity is involved in the accumulation of FN. Plasmin resulting from cleavage of plasminogen by plasminogen activator (PA) is the major enzyme affecting FN degradation in chickens. However, testing for decrease in PA activity showed that this enzyme is not activated even in the controls, therefore, it is unlikely that this would be a major mechanism involved in degrading FN. In humans, there are several MMPs that are known to degrade FN. We found that MMP-2 levels are unaffected by cCAF treatment and that there is no detectable MMP-3, -7 and -10 activity as evaluated by casein zymography using tCEFs as control for production of these stromelysins. Another FN-degrading metalloproteinase, MT-MMP1, is unlikely to be involved because it also activates MMP-2 and this enzyme is not activated by cCAF treatment. Another possible mechanism that may explain FN accumulation could be an increase in TN. TN-C knockout mice show decreased accumulation of FN in wounded tissue and this decrease has been hypothesized to be due to disrupted incorporation on FN into the matrix in the absence of TN-C [32, 33]. Therefore, our observation that inhibition of cCAF-induced TN production decreases the accumulation of FN supports the findings in the knockout mice. However, this does not explain the unchanged FN levels with the N-peptide treatment. One possible explanation for these findings could relate to the fact that FN does not self-assemble. Therefore, it is possible that alterations in the activities of integrins or adhesive sites on other ECM molecules induced by the whole cCAF molecule, and not by the N-peptide, could affect FN accumulation . We are currently pursuing studies to determine whether adhesion molecules or other ECM molecules play a role in FN accumulation due to cCAF-induced TN production. Migration of fibroblasts from the area surrounding the wound into the wound site is critical in order for remodeling of the extracellular matrix and for wound contraction to occur. TN and FN, especially in combination, promote migration, therefore cCAF may facilitate fibroblast migration by increasing TN and FN levels. However, this chemokine is also able to chemoattract fibroblasts and accelerate their migration in the absence of these molecules, strongly suggesting that it contributes to fibroblast movement independently of the deposition of these ECM molecule. These findings suggest that during wound healing, cCAF produced by the resident fibroblasts chemoattracts additional fibroblasts that contribute to the production of these ECM molecules, which then support migration of both fibroblasts and other cells in the wound tissue. TGFβ1 is another factor known to stimulate myofibroblast differentiation, ECM production and accelerate wound closure and healing. However, this growth factor has a strong inflammatory effect that leads to excess fibrosis and scarring. In addition to greatly increasing accumulation of Colls I and III, TGFβ1 has been shown to also increase FN and TN production. cCAF (and maybe other chemokines), on the other hand, may have a subtler, more controlled effect, promoting the earlier appearance of a normal granulation tissue without leading to excess matrix accumulation and scarring. 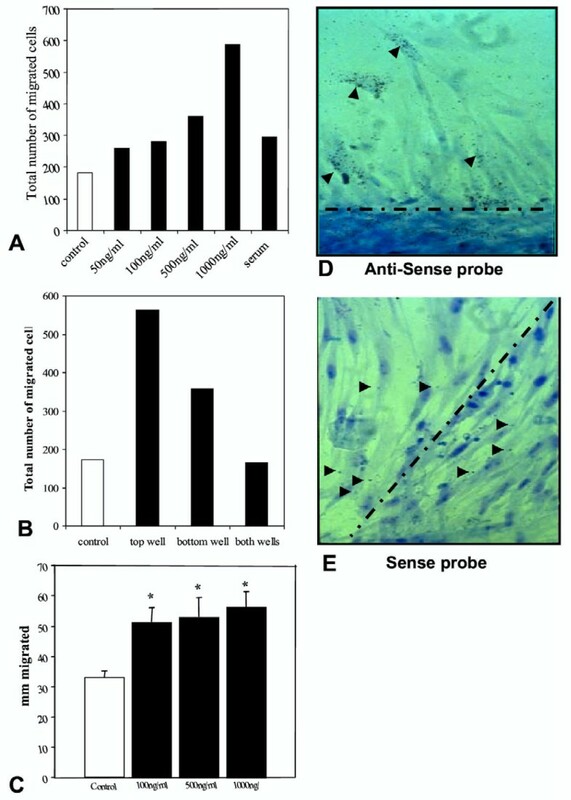 Our results strongly suggest that cCAF plays an important role in wound repair by activating fibroblasts to form early granulation tissue, through cell migration, myofibroblast differentiation and production/accumulation of ECM molecules that are critical for proper development of the healing tissue of wounds. This is a previously unknown role for chemokines and, unlike other inflammatory factors that promote granulation tissue formation, cCAF does not appear to stimulate increased fibrosis. If similar behavior is seen in human chemokines, it could be a promising target in designing drugs that promote formation of granulation tissue in poorly healing wounds without causing excess scarring. All tissue culture supplies and the TRIzol reagent were purchased from Gibco-BRL. cCAF and the N-terminal peptide (15a.a.) were synthesized by Gryphon Sciences (San Francisco, CA) and C-terminus peptide (28a.a) was made by Milligen Biosearch (San Rafael, CA). Secondary antibodies used: anti-mouse and anti-rabbit horseradish peroxidase, anti-mouse Texas Red (Amersham: Piscataway, NJ) and anti-mouse FITC (DAKO: Carpinteria, CA). Primary antibodies used: mouse anti-chicken Coll I, Coll III, FN, and TN (Hybridoma Bank, Iowa), rabbit anti-chicken TN (Chemicon, Temecula CA). Rabbit anti-human MMP-1 and TIMP-2 and mouse anti-human TIMP-1 were the kind gift of Dr. Tai-Lan Tuan. The ECL reagents were purchased from Amersham; Vectashield mounting medium from Vector Laboratories (Burlingame, CA); DC protein assay kit from Bio-Rad (Hercules, CA); Biocoat and Transwells from Fisher and Biocclusive bandage from Johnson&Johnson Medical (Arlington, TX). Primary chicken embryonic fibroblasts were cultured as previously described [3, 4]. Briefly, primary fibroblasts were isolated from 10-day-old chicken embryos and cultured for 4 days. These cultures were passaged once and used as secondary cultures at a density of 0.3 × 106 cells/35 mm plate. Due to the use of primary cells rather than cell lines, there are variations in cellular responses between sets of cells. Therefore, internal controls were always included and results from different batches of cells were not averaged. Secondary cultures were treated with 750 ng/ml cCAF [68 nM] or its terminal peptides in 199/tryptose phosphate broth and 2% donor calf serum. This dose of cCAF was chosen because it was the optimal dose for inducing differentiation of myofibroblasts, cells known to produce large amounts of ECM . Media was changed and new cCAF or peptides added every day for 4 days. Proteins were extracted from the cells after 4 days of treatment, using 150 mM RIPA buffer containing protease inhibitors. Protein concentrations were determined using the DC protein assay kit (Bio-Rad) and samples were adjusted to contain equal amounts of protein. Proteins were separated on 7.5% Doucet gels  and transferred to nitrocellulose was performed using a wet-transfer apparatus (Bio-Rad) at 100 V for 45 min. The membranes were blocked for 1 h in 5% milk in TTBS and then incubated overnight at 4°C in primary antibody (1:50 anti-Coll I, anti-Coll III and anti-FN, 1:100 TIMP-1, 1:500 anti-MMP-1 and anti-TIMP-2, 1:1000 anti-TN), in 1% milk in TTBS. The membranes were washed 3 times for 10 min each with TTBS, incubated in anti-mouse or anti-rabbit HRP (1:10,000) in 1% milk for 1 hr and washed as above, the bands visualized using the ECL (Amersham). Densitometry was performed using BandScan software (Glyko). At the end of treatment, the cells were rinsed with PBS, fixed and permeabilized in 4% paraformaldehyde with 0.15% Triton X-100. After fixation, the cells were washed and then incubated with PBS containing 0.1 M glycine for 10 min. Cells were blocked for 30 min with 10% goat serum in PBS, incubated with primary antibody (1:100) in 1%BSA/PBS for 1 hr at room temperature (RT), and washed three times with 0.1% BSA/PBS for 10 min each. The cells were then incubated in secondary antibody in 1% BSA/PBS for 1 hr at RT, washed three times for 10 min with 0.1% BSA in PBS and mounted with Vectashield. Zymography was performed using denaturing polyacrylamide gels according to the protocol of ref. . Gels to test for gelatinolytic activity contained 1% gelatin (Sigma) and those that tested for caseinolytic activity had 1% casein (Sigma). 5 μl of 0.25% trypsin-EDTA (Gibco-BRL) was used as a positive control for the casein zymogram. A chromogenic plasminogen activator substrate (Boc-Val-Gly-Arg-βNA.AcOH) was purchased from Calbiochem. 50 μl of a 10 mM stock solution of substrate in water was added to 200 μl 0.1 mM HEPES buffer pH 8.0 and heated to 25°C. 25 μl fibroblast substrate was added to the substrate and incubated for 30 min. Absorbance was then read at 405 nm. Positive control: Supernatant from Rous sarcoma virus-transformed CEFs (tCEFs), which are known to produce high levels of PA.
For these experiments we used phosphothioated antisense oligodeoxynucleotide (ODN), synthesized and HPLC purified by Sigma Genosys, to block the TN production. The sequences for the oligonucleotides were the same as previously described  except that we used phosphothioated oligos rather than morpholino oligos. The antisense sequence of the ODN was 5'-GGAGTCCCATTGTAGTGCTCAGTTC-3'. The sense strand of this ODN was used as control (5'-GAACTGAGCACTACAATGGGACTCC-3'). When preparing the cell cultures, 1 μM and 2 μM of antisense or sense ODN were added to the cells at plating. The cells where treated with antisense or sense ODN and cCAF every 24 hrs for 3 days to allow accumulation of the ECM molecules. Total RNA was extracted using TRIzol reagent from untreated fibroblasts and fibroblasts treated with 750 ng/ml cCAF for 4–48 hrs. Transfer of RNA to membrane was performed as previously described . RNA probes were made using the Strip-EZ kit from Ambion (Arlington, TX). Membranes were prehybridized for 2 hrs in Ambion Hybridization buffer at 62°C, and hybridized O/N at 62°C. Membranes were washed with 2 × SSC/0.1% SDS at 62°C and exposed to film for 6–48 hrs. Total RNA was extracted as above. RT-PCR was performed using the Promega Access RT-PCR System, following Promega's instructions. The first strand was synthesized at 48°C and DNA was amplified at 95°C 45 sec, 55°C 1 min, 68°C 1.5 min for 40 cycles. 3 μl Quantum mRNA classic 18S primers from Ambion were used to quantify total RNA levels. Primers used for TN amplification: sense 5'AAATGCATCTGCGAGGGC, antisense 5"GGAAGCTTGTTATTGCAGTCCTTCGG . Full-thickness excision wounds (approximately 0.5 × 0.5 cm) were made on the underside of the wings of 2 week-old chicks, using a scalpel blade. The left wing was treated with vehicle alone, and the right wing with 1 μg cCAF. The wounds were photographed immediately after wounding and then covered with Biocclusive bandage. 50 μl vehicle or cCAF were deposited through the bandage onto the wound using a 30-gauge needle. This procedure was repeated the next day and every other day thereafter on days 3, 5 and 7. Samples were collected at days 3 and 7 post-wounding for ECM analysis. All experimental work with animals reported here was done under full compliance with our animal protocol approved by appropriate campus authorities. At the specified time points, chickens were euthanized with sodium pentobarbitol. The wounded wings were collected and fixed for 18 hrs in 4% paraformaldehyde and decalcified for 3 days in 5% formic acid, 2.5% formaldehyde at 4°C. The tissue was embedded in paraffin and sectioned. Sections were stained with Masson Trichrome to visualize interstitial collagen. Other sections were immunolabeled for FN or TN. Sections were deparaffinized in 3 changes of Hemo-De for 15 min each and rehydrated in a descending ethanol series (5 min each: 100%, 95%, 70%, 50%, 30% ethanol). After rinsing with PBS, sections were fixed in 2% paraformaldehyde for 1 hr. Autofluorescence and non-specific staining were blocked for 30 min in 0.1 M glycine in PBS, followed by 30 min in 1% Evans Blue in PBS to quench red blood cell autofluorescence. Sections were incubated with anti-FN or anti-TN antibodies (1:50) in 1% BSA in PBS for 2 hr at room temperature. After 3 × 10 min washes in 0.1% BSA in PBS, the sections were incubated for 40 min with anti-mouse Alexa antibody (1:200) in 1% BSA in PBS. They were then washed and mounted with Vectashield. Wound tissues were immediately frozen on dry ice and stored at -70°C. To extract protein, the tissue was ground with glass beads in a mortar and pestle on dry ice. The powdered tissue was dissolved in RIPA containing 300 mM salt and a cocktail of protease inhibitors, and vortexed vigorously. After centrifugation, the supernatant was used in immunoblots. 1 × 106 cells in 100 μl 199 medium containing 2% serum were plated on the underside of transwell membranes by inverting the insert. They were allowed to adhere for 30 minutes, then the well was turned right side up and both sides of the well were filled with serum-containing medium. The cells were allowed to recover for 24 hrs, and express the cCAF receptors. Then the medium in the top well was changed to serum-free medium containing 50–1000 ng/ml cCAF or 2 % serum (positive control); serum free medium alone was placed in the bottom well. The cells were allowed to migrate towards the chemoattractant for 24 hrs. The cells on the underside of the membrane were removed with a cotton swab. The membranes were then fixed and stained with 2% toludine blue in formaldehyde. To determine the number of migrated cells, all cells on the upper side of the membrane were counted. Control for chemotaxis was performed by adding 1000 ng/ml cCAF to both wells of the Transwell unit. 1 × 106 cells in 100 μl 199 medium containing 2% serum were plated in a cloning ring in a 35 mm plate. They were allowed to adhere for 1 hour, then the ring was removed, the culture medium added to the plate and the cells photographed on a phase-contrast microscope to record the area of the cells and the edge of the ring. cCAF was then added at various doses (0–1000 ng/ml). The following day the medium was changed and the cells were treated again. On the third day after plating, the cells were photographed once more before the experiment was terminated. To determine the extent of cell migration, we measured the distance between the edge where the cloning ring was at day zero and the edge of the culture delineated by the migrating front of the cells on the 3rd day. Fibroblast cultures and probes were prepared as described previously (Martins-Green and Bissell, 1990). Briefly, probes were prepared as follows: 1 μg of pGEM1/cCAF cDNA was transcribed for 1 1/2 h at 37°C in a cocktail containing 100 μM each of 3H-ATP and 3H-UTP (Amersham Corp.), 1 mM each GTP and CTP, 120 mM dithiothreitol, and 100 U of T7 polymerase (Amersham Corop.). The probe was separated from the free nucleotides in a Sephadex G-50 column equilibrated with 50 mM tris(hydroxymethyl) aminomethane pH 8.0, 15 mM NaCl, and 1 mM EDTA. For in situ hybridization, cells were fixed in 4% paraformaldehyde containing 5 mM MgCl2, incubated in 0.1 M glycine for 10 min, dehydrated 3 min each in 30, 70, and 100% ethanol, and allowed to dry. Prehybridization was performed in a solution containing 60% formamide, 0.1 M piperazine-N,N'-bis(2-ethanesulfonic acid) pH 6.4, 0.4 M NaCl, and 0.2 mg/ml of E. coli tRNA (Sigma, St. Louis, MO) for 2 h at 55°C with gentle shaking. The hybridization solution was the same as the prehybridization solution but contained 106 cpm/ml of the cCAF probe or with the same number of counts of the vector probe and incubated at 55°C for 48 h with gentle shaking. At the end of this period, the cultures were washed twice with 2× SSC + 0.1% Triton-X 100 for 1 h followed by two more washes with 0.1× SSC + 0.1% Triton-X 100, all at 55°C in the shaker. The cultures were allowed to dry, then covered with emulsion and processed as described previously . JEF carried out all studies except for the TN antisense inhibition experiment. LW and QJL initials carried out the TN antisense studies. MMG initials conceived and designed, with JEF, the studies, and contributed to manuscript preparation and submission. We thank Ibsen Chen for assistance with the preparation and sectioning of the wing tissues. Dr. Tai-Lan Tuan kindly provided us with the MMP and TIMP antibodies. This work was supported in part by a Dissertation Research Grant from the University of California, Riverside and a GAANN fellowship (U.S. Department of Education) to JEF and by NIH grant GM48436 to MM-G.